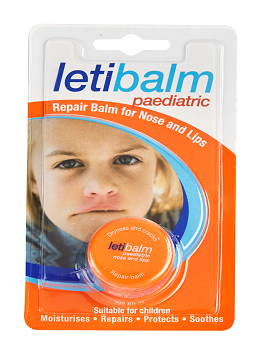 Letibalm is the only product available in South Africa, specially designed to care for lips, nose and the skin in between. It is a gentle, restorative balm that moisturises dry skin, helps to repair chaps and cracks and calms irritation. It also creates a protective layer to prevent further damage. 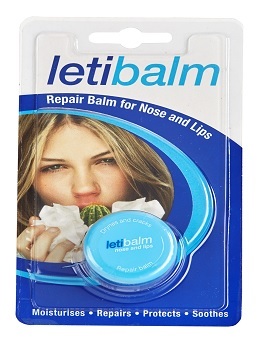 Made with natural decongestants menthol and camphor, Letibalm will help ease breathing. It is suitable for the treatment of dry skin, chapping and cold sores caused by repeated nose-blowing. Letibalm also helps protect the skin and repair damage caused by exposure to cold, wind and sun. 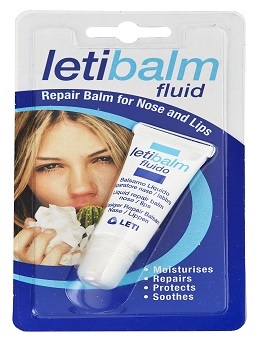 Letibalm Repair Balm Liquid comes in a 10ml tube. Letibalm is the only product available in South Africa, specially designed to care for lips, nose and the skin in between. It is a gentle, restorative balm that moisturises dry skin, helps to repair chaps and cracks and calms irritation. It also creates a protective layer to prevent further damage. Made with natural decongestants menthol and camphor, Letibalm will help ease breathing. It is suitable for the treatment of dry skin, chapping and cold sores caused by repeated nose-blowing. Letibalm also helps protect the skin and repair damage caused by exposure to cold, wind and sun. Letibalm Repair Balm comes in a 10ml tub.